biodiesel industry. The microorganism Escherichia coli (E. coli) K12 was used for fermentation of glycerol. ments to establish regulations to reduce CO2 emissions. 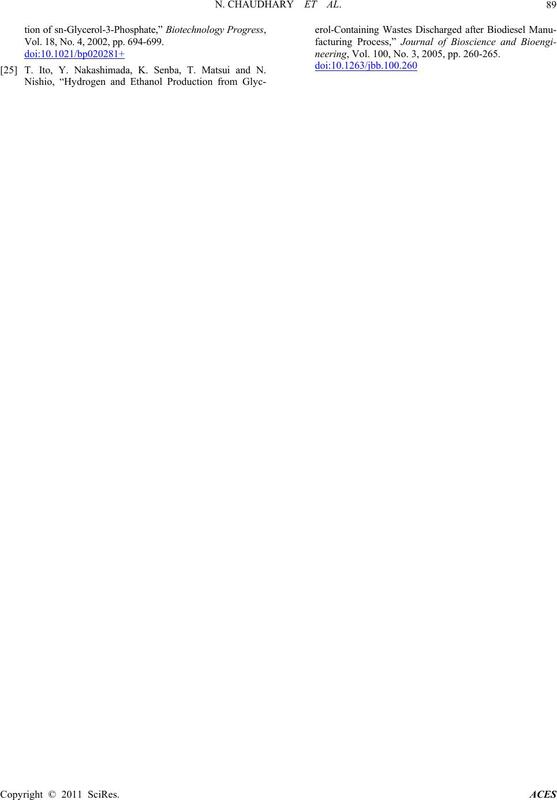 pounds has been investigated by many authors [10-14]. limiting factors for the use of these microorganisms . Dharmadi , Hu and Wood  reported that E.
was higher than those obtained with other organisms. 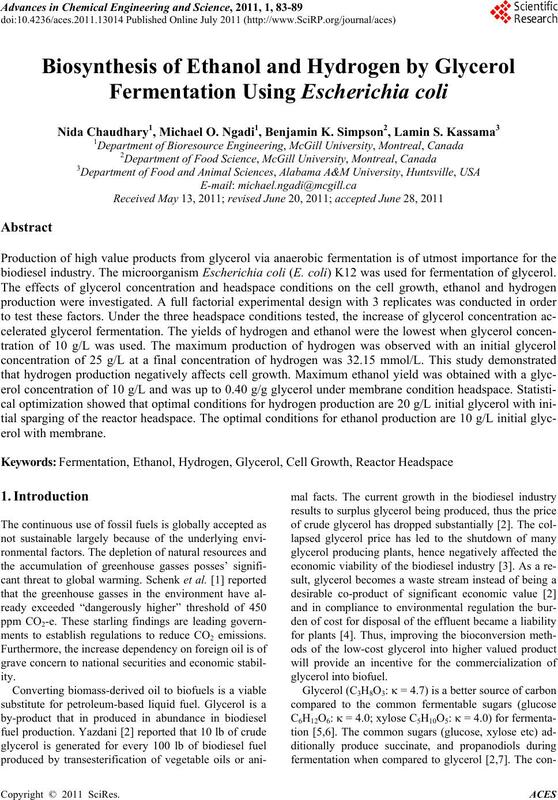 fermentation is significant in glycerol production . 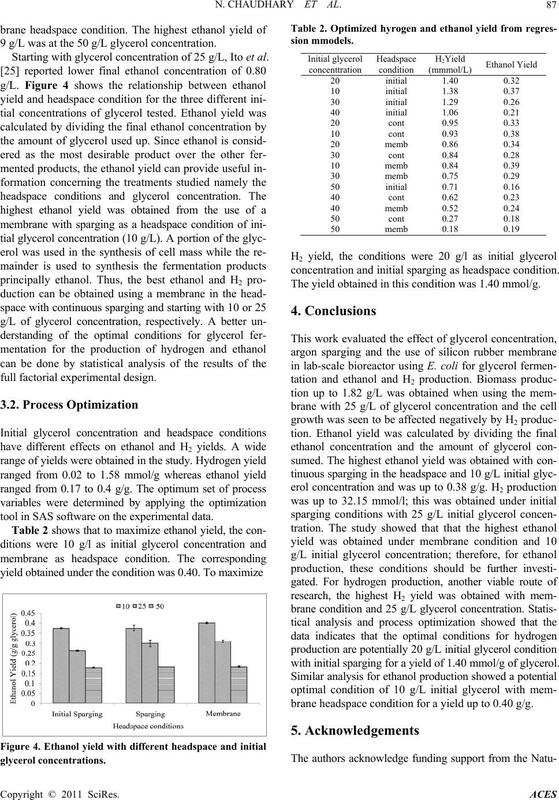 high-yield production of ethanol from low cost glycerol. with E. coli in lab-scale bioreactors. jar (Oxoid Anaerojar, AG0025A) for 24 hours. plemented with 5 g/L yeast extract and 10 g/L tryptone. oculated to maintain an initial O.D of 0.05.
stored for analysis at –20˚C. A full (2 × 3) factorial design with 3 replicates was used. package was used for data analysis. Table 1. Experimental design and set-up of the bior e act or s.
strain MG1655 (ATCC 700926) is shown of Figure 1.
parently falls within the stationary period. Dharmadi et al. strains used as well as varied experimental conditions. of hydrogen, t h us i nhi bi t development of bi omass . result is different from the results obtained by Zhu et al. 10 g/L and initial sparging headspace condition. 9 g/L was at the 50 g/L glycer o l concentration. 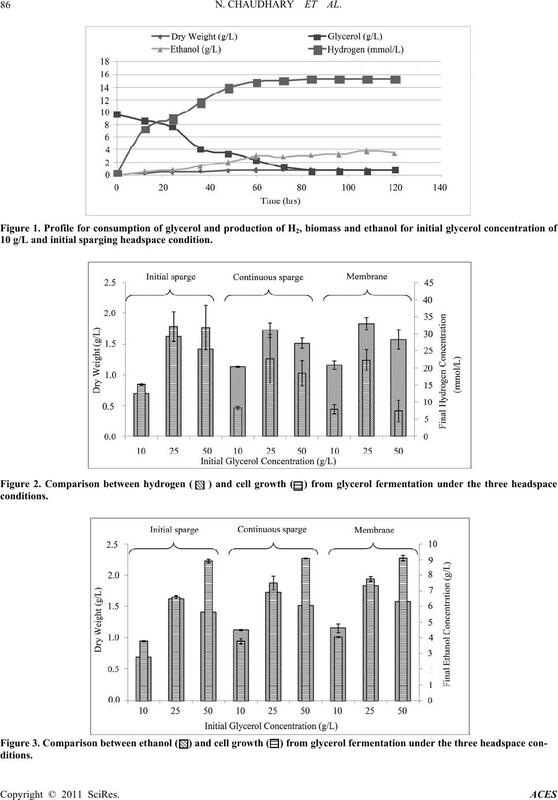 Starting with glycerol concentration of 25 g/L, Ito et al. 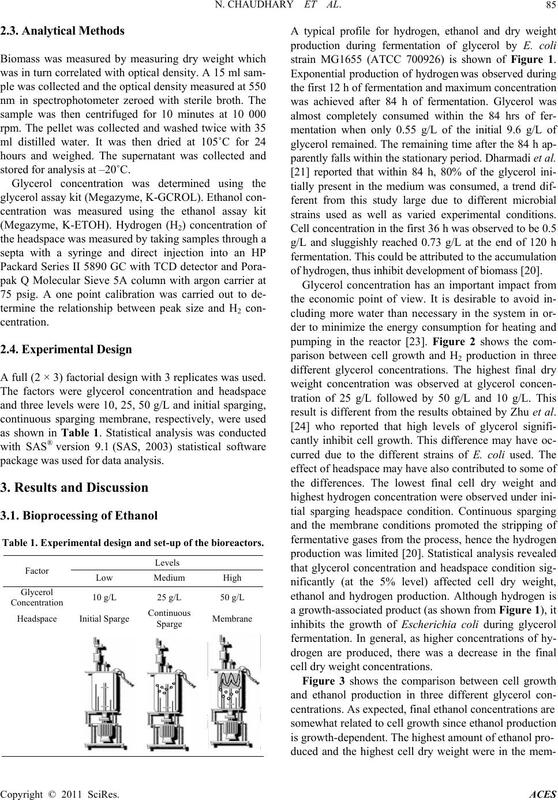 tool in SAS soft ware on the experiment al dat a.
glycerol concent ra t io ns . concentration and initial sparging as headspace condition. The yield obtained in this condition was 1.40 mmol/g. with initial sparging for a yield of 1.40 mmol/g of glycerol. brane headspace condition for a yield up to 0.40 g/g. ral Sciences and Engineering Research C ouncil of C anada. 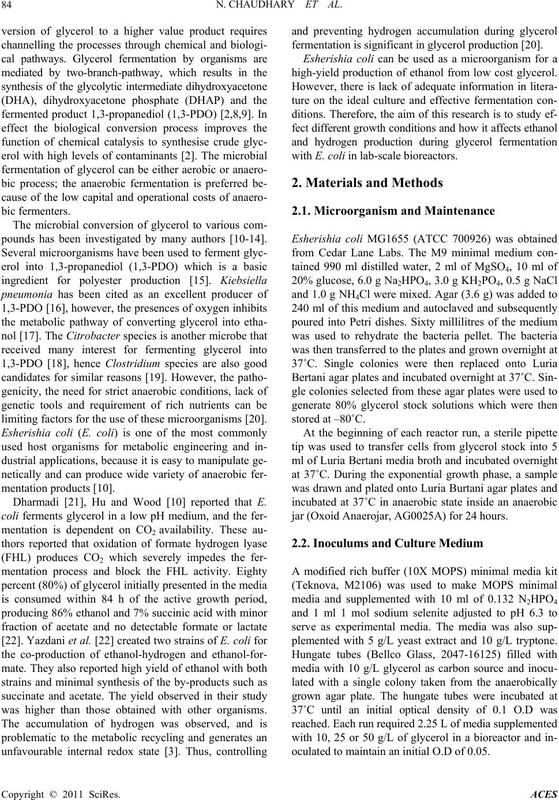 for Biodiesel Production,” Bioengineering Research, Vol. 1, No. 1, 2008, pp. 20-43. News, Vol. 84, No. 6, 2006, p. 7. Vol. 66, No. 2, 2004, pp. 131-142. G. Durnin, J. Clomburg, Z. Yeates, P. J. J. Alvarez, K.
gineering, Vol. 103, No. 1, 2008, pp. 148-161. New York, 2003, pp. 60-73. K. S. Tyson, J. Bozell, R. Wallace, E. Peterson and L.
ology, Vol. 146, No. 4, 1995, pp. 279-290.
cations, Vol. 391, No. 1, 2010, pp. 1033-1038. 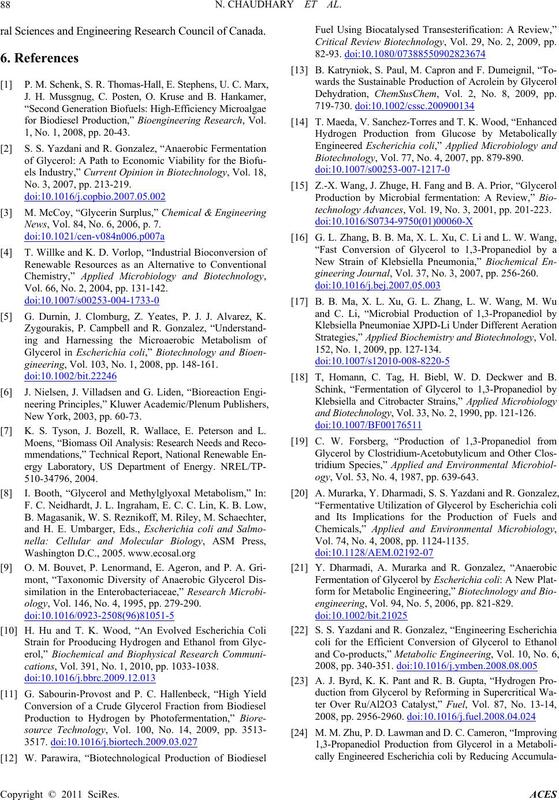 Critical Review Biotechnology, Vol. 29, No. 2, 2009, pp. Dehydration, ChemSusChem, Vol. 2, No. 8, 2009, pp. Biotechnology, Vol. 77, No. 4, 2007, pp. 879-890.
technology Advances, Vol. 19, No. 3, 2001, pp. 201-223.
gineering Journal, Vol. 37, No. 3, 2007, pp. 256-260. Strategies,” Applied Biochemistry and Biotechnology, Vol. 152, No. 1, 2009, pp. 127-134. T, Homann, C. Tag, H. Biebl, W. D. Deckwer and B.
and Biotechnology, Vol. 33, No. 2, 1990, pp. 121-126.
ogy, Vol. 53, No. 4, 1987, pp. 639-643. Vol. 74, No. 4, 2008, pp. 1124-1135.
engineering, Vol. 94, No. 5, 2006, pp. 821-829. Vol. 18, No. 4, 2002, pp. 694-699. T. Ito, Y. Nakashimada, K. Senba, T. Matsui and N.
neering, Vol. 100, No. 3, 2005, pp. 260-265.